Join us for a mesmerising mix of man-made sights and astounding natural wonders. From Shanghai’s glass and steel to centuries-old Beijing, this tour takes in Giant Pandas, Xi’an’s legendary Terracotta Warriors and the ‘silk city’ of Suzhou. On a cruise down the ageless Yangtze, you’ll witness the spectacular Three Gorges Dam – an engineering marvel – and discover a land rich in myth, legend and stunning scenery. Board your overnight flight to Shanghai. Upon arrival, meet your guide and transfer to your hotel, before enjoying a guided introduction to this amazing city. The colonial grandeur of the buildings that line the west bank of the Huangpu River, on the famous Bund, hint at past glories, and are now surrounded by the modern city’s gigantic skyscrapers. Your tour will include a visit to the rocket-shaped Pearl TV Tower, which surveys the city, and the fascinating Shanghai City History Museum. 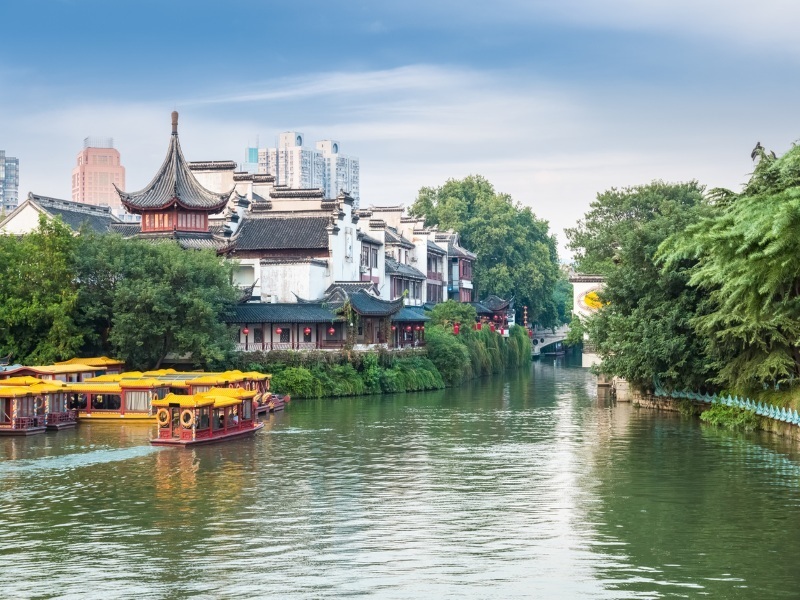 This morning, tour Shanghai’s Old City, at the heart of which is the 16th-century Yuyuan classical Chinese garden, with its pools, walkways and bridges – a haven amongst the bustling bazaars and street markets. After a fascinating morning, board the coach for the 90-minute journey to the ancient city of Suzhou and your next overnight stay. With its silk trade associations, tree-lined waterways and thousand-year-old classical gardens, Suzhuo, set on the Grand Canal, is a breathtaking gem. Discover the Old City’s charms, visit the beautiful Lingering Garden and the Silk Embroidery Institute, and enjoy a canal cruise as this fascinating place is brought to life by your guide. Late this afternoon, board a high-speed train for the journey north to Beijing, where you’ll spend three nights. Tour the Chinese capital with your guide, visiting some of its most famous attractions. You’ll see Tiananmen Square, site of Chairman Mao’s tomb and gateway to the great Imperial Palace (the iconic Forbidden City). In the Palace’s ceremonial halls and living quarters, as well as in part of the vast museum, you’ll gain an insight into the extraordinary lives led by its privileged occupants – 24 Chinese emperors. You’ll end your day in Beijing with a traditional ‘Peking Duck’ dinner. The Great Wall of China is famously (though not entirely accurately) the only man-made structure visible from space. Travel to Badaling, where, amid steep, forested hills, part of the wall has been lovingly restored, and it’s easy to appreciate the immensity of this marvellous feat of engineering. Your day will also include the opportunity to see the exterior of the amazing ‘Bird’s Nest’ stadium from the 2008 Olympic Games for yourself. This evening, you might choose to join an optional excursion to the world-famous Beijing Opera, to discover its mix of song, dance and acrobatics. The majestic and tranquil Summer Palace at Yiheyuan is today’s destination. You’ll also have the opportunity to step back in time on a tour of the ancient hutongs, Old Peking’s fast-disappearing labyrinth of narrow alleyways. Bid farewell to Beijing, transferring to the airport to fly to the port of Yichang. There you’ll meet a five-star ship for your cruise on the Yangtze, the third longest river in the world. The journey upstream is highly enjoyable, not least for the change of pace. Spend three unforgettable days enjoying the ever-changing vistas from your ship, as you cruise the mighty Yangtze River. Rest and relax on board, join early morning Tai-Chi sessions and hear the legends of the Three Kingdoms. First off, you’ll visit the immense Three Gorges Dam, the world’s largest hydroelectricity project – a controversial feat of engineering that has wrought drastic change on the riverscape. You’ll then sail through Xiling Gorge, the longest and deepest of the Three Gorges, which together stretch over 200km and vary from 100 to 300 metres in width. The ‘Small Three Gorges’ on the Daling River are a stunning backdrop for an excursion by boat. Sail through Wu Gorge and Qutang Gorge, admiring the sights of one of China’s most dramatic regions. Though changed forever by the famous dam’s construction, the landscape retains the spectacular grandeur of its 900-metre cliffs and jagged peaks. Early risers can join in the on-deck Tai Chi session before a buffet breakfast. This morning’s port of call is the 2000-year-old ‘Ghost City’ of Fengdu, a place shrouded in ancient legend and Taoist teachings about the afterlife. For your last evening on board, join the Captain for a Farewell Dinner and crew show. Disembark in Chongqing, and enjoy a guided introduction to one of modern China’s fastest-growing cities. Visit the contrasting 100-year-old streets of Ciqi Kou and explore beautiful Goose Neck Park, before boarding a fast train into Sichuan province and the relaxed, modern city of Chengdu, where you’ll stay for the next two nights. In Eastern Sichuan’s capital, modern developments contrast with the traditional tea-houses and colourful shops of old Jinli Street. One of the highlights of your stay in Chengdu will be a visit to the Giant Panda Breeding Research Centre – learn about these wonderful creatures and the steps being taken to ensure their future survival. Dinner this evening will give you an opportunity to sample traditional Sichuan cuisine. Today you’ll take the high-speed train to China’s ancient capital, Xi’an, for a two-night stay. You’ll visit the ancient city walls of this fascinating treasure trove, with its Great Mosque in the Muslim Quarter and its Tang dynasty monuments. This evening, enjoy a traditional Dumpling Dinner. An unforgettable day awaits, as today brings a chance to marvel at the legendary Terracotta Army – some 8,000 lifelike foot-soldiers, horsemen and charioteers discovered in 1974 – now one of the world’s greatest tourist attractions. Close by, the yet-to-be-excavated tomb of emperor Qin Shi Huang is said to contain a vast underground city. You’ll complete your tour of Xi’an’s ancient treasures with a visit to the Small Goose Pagoda, before an evening in the city. You’ll fly back to Shanghai for a final evening in modern China’s most vibrant metropolis. Discover the preserved streets of the former French Concession, also home to some of Shanghai’s most chic boutiques. This evening, complete your visit to China with an optional City Nightscape Cruise. Transfer to the airport, early this morning, for the daytime flight back to the UK at the end of a truly wonderful holiday.